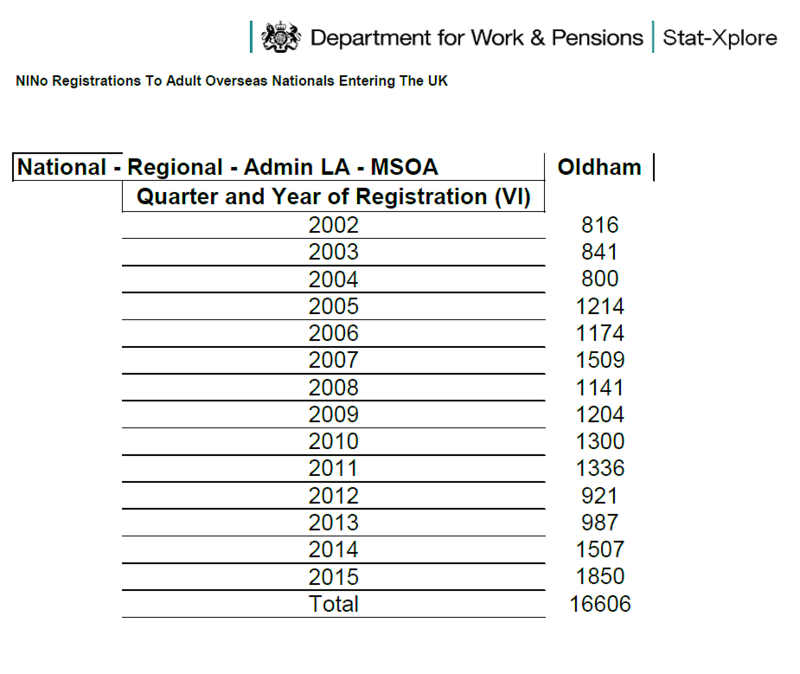 1850 adult foreign nationals entering the UK in 2015 registered for new national insurance numbers from Oldham addresses a 22.7% increase on 2014 and the highest figure on record which started in 2002, 38% of the total influx came from Romania. To these numbers we have to speculate about how many dependents also arrived and add the 682 asylum seekers housed in Oldham as of December 2015. Despite the BBC announcing immigration is down figures actually show that in the 2015, 828,000 overseas nationals registered for a new UK National insurance no’s (an increase of 60,000 (8%) on figures for 2014. 170,000 Romanian citizens were allocated UK national insurance numbers in 2015 and 39,000 Bulgarian citizens.